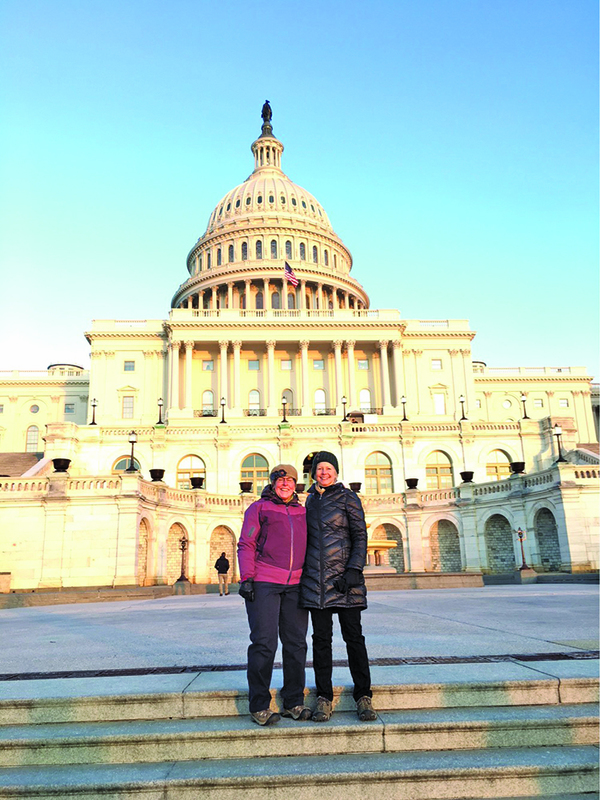 Nurse practitioners Jane Hoover and Cynthia Dalsing traveled to Washington, D.C., last month for the 2018 American Academy of Nurse Practitioners Health Policy Conference. There, they learned how to bring their concerns to those representing them in the nation’s capital. It didn’t take long for what they learned to come in handy, as the two Sandpoint healthcare providers used that same trip to meet with Rep. Raul Labrador, Sen. Mike Crapo and Sen. Jim Risch. Dalsing and Hoover pose before the U.S. Capitol Building during their D.C. visit in early February. Coutesy photo. They said they brought forward three issues that impede treatment for patients who rely on nurse practitioners: diabetic shoes, hospice referrals and in-home health services. Hoover, who practices at Family Health Center, said nurse practitioners can take care of people with diabetes “from the time they’re born until the time they die,” including prescribing insulin and other medications, but they can’t prescribe diabetic shoes. If a patient needs diabetic shoes, a physician — not a nurse practitioner — must sign off. The same applies if a patient needs hospice or in-home care. Hoover and Dalsing said they have several patients who have been seeing them their entire lives. Dalsing said nurse practitioners are often primary care providers in small communities because physicians are less likely to open practices in rural places. With their N.P., the patient’s care has been consistent. Then suddenly, they are visiting a new office and retelling their entire story in order to receive needed accommodations. Then, after they hurdle that issue by visiting a physician, Hoover and Dalsing are given back the healthcare reigns for that patient. Not only are these roadblocks costly and inconvenient — in some cases, Dalsing said, they can be deadly. She said she has signed the death certificates of three patients because she could not get them the help they needed in time. Hoover said she is lucky to have a physician in her office. He is able to sign off on such care measures for her patients fairly quickly. She said the law language’s limiting nature was likely not intended. Dalsing said that the laws are physician-specific because they were written well before nurse practitioners were practicing at the high rates they are now. Dalsing said change is necessary so that nurse practitioners can provide complete care throughout a patient’s life, preventing conditions from worsening to the point where everyone suffers: the patient, the care providers and even taxpayers. She said a $300 pair of diabetic shoes will be cheaper in the long-run than a $10,000 amputation wound. “We’re on the front lines of healthcare,” Dalsing said, noting that there were more than 300 nurse practitioners in D.C. at the same time she and Hoover were, meeting with their specific representatives about the same issues. Hoover and Dalsing said their trip to D.C. had many purposes, but both agreed that they were just trying to do what nurse practitioners do best: fight for their patients.